The UP-DF750 FilmStation™ Dry Film Mammography Imager is a unique and versatile multi-film imager that supports both mammography as well as several other radiology applications. The model is based on the cost effective and highly reliable design of the dual tray UP-DF550 FilmStation imager and adds a 3.8” graphic quality LCD front panel for more user-friendly option. The new UP-DF750 adds a high- resolution thermal head allowing it to output diagnostic quality mammography films. It is capable of printing multiple film sizes 8X10”, 10X12”, 11×14”, and 14×17” for general radiology applications as well as specialized 8×10” and 10×12” film for mammography imaging. 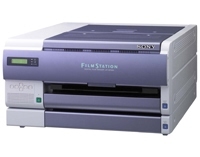 The UP-DF750 incorporates Sony’s direct thermal printing technology producing outstanding images with superb image resolution of 604 DPI with 3.8 D-max that lends its excellent resolution to compliment any FFDM system. It can be mounted horizontally or vertically, ideal for facilities that need to maximize their space.